-All 1st quality DIRECT from Mullican distribution warehouses. Mullican 20 to 40% off retail !!! Call DIRECT at 407-925-0917 !!! Renowned for its high-quality hardwood flooring and environmentally sound manufacturing practices, Mullican Flooring provides customers with endless possibilities for beautifully designed spaces. Mullican’s distinctive collections are available in elegant, smooth finishes, as well as rustic, hand-sculpted or wire-brushed surface treatments. Unique features also include random 6- and 7-foot planks and exceptionally wider widths — up to 7 inches. 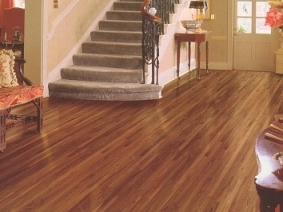 The first in the hardwood flooring industry to offer a “lifetime moisture warranty” on select products, Mullican is also known for having the most efficient kiln-drying process in the business, along with stringent inspections, which ensure consistently high milling quality and grade for all Mullican products. The company’s solid flooring is produced exclusively in the United States, along with a substantial amount of engineered flooring. .
-On Sale. -Call For Pricing!!! -Mullican Mount Castle 7 1/2"
-Mullican Mount Castle 9 1/2"